Florine Barham remembers that night. So does Don Cunningham. It was the last class of the 1975 Celebration. Three stallions, all sons of the mighty Zane Grey, battled for the right to be called World Champion in a showdown that had people on their feet, screaming and cheering. “That was the best show I’ve ever witnessed,” said Cunningham. 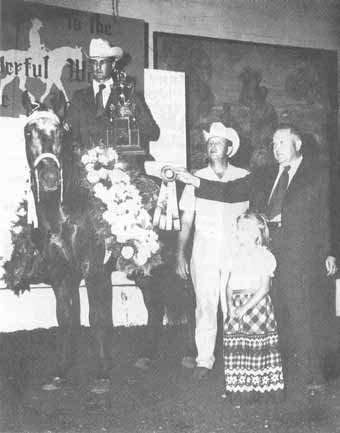 This showcase of equine talent was just what Joe Hinds, Dale Esther, and Rondo Prock had envisioned when they had planned the first Missouri Fox Trotting Horse Jubilee Celebration, held on September 29, 1959. 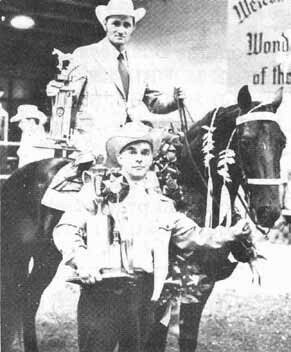 In 1948, 15 men had started the first Missouri Fox Trotter association, securing a charter and starting a stud book. But, a 1955 fire in the home of the Secretary burned the stud book and all of the records. 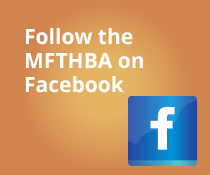 By 1958, the MFTHBA was reorganized, with Hinds as President, Esther as Vice-President, and Prock as Secretary. “The idea for the show was to promote the breed and get people to register their horses,” said Janet Esther, widow of the late Dale Esther. “Fox Trotters had to be gait verified, and lots of people who showed brought their horses to be registered right before the show,” she said. The first shows were held at the Ava City Park baseball diamond at the Douglas County Fairgrounds. “Right before the show, they would remove the bases, drive steel posts into the ground and make a circle using rope. People parked their pickups and sat outside the circle in lawn chairs,” said Cunningham. A few horses were housed in the buildings with stalls that had been set up for feeder calf and pig sales. “The first show was a pretty local affair,” said Esther. “Most of the people who were there were from Missouri or Arkansas.” Some people rode or ponied their horses in, but most hauled their horses in the back of stake-bed pickups. They would back the trucks to an appropriate place and have the horses jump out. After the show, they would haul their horses back home. 14 classes were held that day, some of them in the rain. 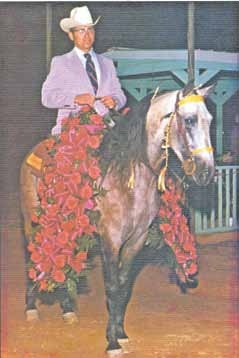 Dale Esther’s great stallion, Golden Governor, was crowned champion at the show, which would not have a stakes class until the next year. Board Secretary Rondo Prock was the announcer, a job he would handle for the next 29 years. The following year a feeder calf sale at the fairgrounds forced the show to be moved to West Plains. This was the only time the show would not be held at Ava. “The first shows were really small, like little one-day shows,” said Esther. “There were a few model horses during the day, with the performance classes at night. Every class was just an open class. Men and women competed together. There were no divisions. Pretty quickly people came from all over to see the horses. These shows were where you’d go to renew acquaintances with people from all over,” said Esther. “We had outgrown the old grounds,” remembered Florine Barham. (At one show) we took Dean Esther’s old horse and put him in the shed. It just rained and rained. We had a friend that had come in from Kansas. You couldn’t even find a parking place, so he slept in the shed. That old horse snored all night long and kept our friend awake,” she said. The name of the horse? Missouri Traveler. Scoring the classes was done by Rondo Prock‘s wife, Virginia. She remembers scoring classes in the rain at the old fairgrounds while Rondo held a tarp over her head. The only Board members who didn’t show, the Procks were kept busy during show season. “We scored the cards, the show ribbons were sent to our house, we had to get the girls to present the trophies, and we had to get the preacher,” said Virginia. As the popularity of the Annual Fall Show and Celebration continued to grow, so did the need for bigger show grounds. 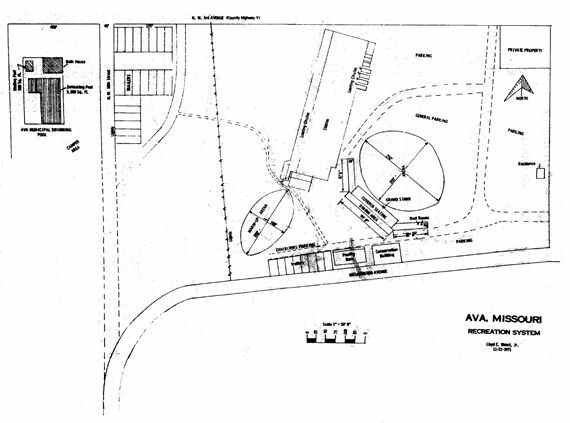 In 1976 the MFTHBA purchased land for the showground just outside of Ava. By 1977 the Show and Celebration was held in its present location. That was the year that the title of World Grand Champion was first used, the honor going to Zane’s Queen of Hearts. Gradually there were other changes, too. New divisions were created, and in 1999 Versatility classes were added to the show. The Versatility arena was completed in 2000. Today people from around the world come to the Show and Celebration. The stallions drove hard, each unwilling to quit. “By half-way through the class, everybody was standing up, hollering and yelling, cheering them on,” said Don Cunningham. “Missouri Traveler was a sorrel, and he kind of stood out from the other two. Zane’s Charming Lad was grey and Zane’s Pride of Princess S, was a kind of buckskin. It was a wonderful show. Nobody in the audience would have cared who won,” said Cunningham. “Rex Barham was riding Missouri Traveler; Pride of Princess was ridden by Dwight Sutherland; and Charming Lad was ridden by Jerry Middleton,” Florine Barham said. “There were two judges and a referee, who would act as a tie-breaker if the other two didn’t agree. The first time they voted, Charming Lad was first, Pride of Princess was second, and Missouri Traveler was picked third by the referee. When they voted again, the first two horses were reversed,” said Barham. In the end, Zane’s Pride of Princess S was declared the winner. “It was a thrill to see the three main horses in the country out there,” said Barham. It’s a moment of the Celebration she will never forget. The Annual Fall Show and Celebration: it’s the place where world grand champions, and unforgettable memories, are made.